The Dallas Zoo in Texas is home to more than 2000 animals and welcomed more than 1 million visitors in 2016. The Dallas zoo features USA Today top zoo exhibits, is the only zoo in Texas with koalas, and was the very first zoo in the Southwest. The Dallas Zoo was founded in 1888 with only 4 animals—2 deer and 2 mountain lions, by the City of Dallas in City Park. By 1910, the zoo grew to 27 animals and moved to Fair Park but had to move two years later to Marsalis Park in Oak Cliff. This move allowed the zoo to expand and become an educational facility and zoo commissioners were put in place. In 1922 the mayor of Dallas appointed a commission to raise funds to improve the zoo that had a collection of 161 animals. $10,000 dollars was raised and in 1925 nearly 900 animals were added to the zoo making the total animals exhibited over 1,000. The most animals ever living in the zoo peaked in 1931 at 1540 before the Park Board was forced to cut exhibits in half during the Great Depression. By the 1940’s the Dallas Zoo was one of the largest zoos in the United States with over 700 animals. Throughout the 1960’s and 70’s rapid growth of the Dallas Zoo lead to the development of a research program, the reptile and amphibian department, and captive breeding programs for which the zoo received dozens of awards. In the 1980’s a $75 million master plan was set forth to renovate the zoo to become naturalistic and improve the zoo’s facilities. By 2001, attendance grew to over half a million visitors per year and several new exhibits opened over the next few years resulting in an increase in attendance and a record high attendance in 2007 and 2008. The Dallas Zoo celebrated its 125th birthday in 2013 as the first zoo in North America to have a cospecies habitat of African Elephants and other Savanna animals. In 2014, The Dallas Zoo was recognized by USA Today as one of the best zoos in the country and achieved continuous accreditation for more than 25 years by the AZA in 2016. The Dallas Zoo is open every day year-round from 9 am to 5pm except for Christmas Day when they are closed. Admission and parking fees are detailed on the website. There are over 100 acres of zoo to explore with maps available at the zoo gates and online. Strollers and wheel chairs can be rented at the Zoofari Market with limited availability. The Dallas Zoo is divided into Zoo North and The Wilds of Africa. For one admission price, visitors get to see both zoos that are connected by tunnel. Zoo North is the original Dallas Zoo and Wilds of Africa is the multimillion dollar expansion that opened in 1990. · Entry Plaza- The main entry to the zoo and where the Endangered Species Carousel is located. The Wonders of the Wild presentation is also located in this plaza where visitors can have interactive encounters with birds and mammals as presented by the zoologists. There is also a Cheetah encounter show, the T-Rex Mini Train entrance, and Lemur Lookout all accessible in the Entry Plaza. · ZooNorth Center- The middle of the zoo features the flamingo pond, tiger habitat, otter outpost and the Zoofari Food Court with several places to sit and rest. · Koala Walkabout- The only koalas in the state of Texas are featured in the walkabout where animals from the outback are featured. Meet wallabies, kangaroos, and hand feed lorikeets. · Picnic Ridge- Picinic Ridge is a stop on the T-Rex Express Train. · Lacerte Family Children’s Zoo- This zoo within a zoo provides hands on experiences for children with animals through bird feedings, farm animals such as pigs, donkeys, guinea pigs, and rabbits, goats, and a nature play place. The Party Place where birthday celebrations happen is in the Children’s Zoo as is the Nature Exchange and The Underzone. · Primate Place- This outdoor habitat is home to primates like spider and swamp monkeys, tamarins and gibbons. · Wings of Wonder- Raptors and Galapagos tortoises share this space. · Cat Row- Smaller predatory felines like the bobcat and ocelots share cat row with the mountain lion. · Herpetarium- This indoor building houses reptiles and amphibians, as well as the ghosts of the bayou exhibit featuring an albino alligator and other creatures from the swamps. · Bug U!- This indoor exhibit is full of the creepy crawly invertebrates from Texas. · Wildlife Amphitheater- Found in the Entry Plaza, this is where wildlife presentations such as Wonders of the Wild take place. · Gateway- Go through the tunnel between Zoo North and Wilds of Africa and visitors will enter the Gateway home to the Don Glendenning Penguin cove where African Penguins and Mandrills live. · Gorilla Trail- A visitor favorite, the Gorilla Trail feature the Hamon Gorilla Conservation Research Center, the brand-new Hippo Outpost, an Aviary, Gorillas, crocodiles, meerkats, storks, and Chimpanzee Forest. · Ndebele Plaza- Centrally located and near the entrance to the tunnel, the Plaza is where visitors will find the Play area, Serengeti Grill, Wild of Africa Grill, and the Adventure Safari Station. · Wilds of Africa Adventure Safari- This train takes visitors through the back habitats of the zoo that are not accessible any other way. Visitors can see 6 habitats—mountains, river, arid, semi-arid, bush, and woodlands on the one-mile loop that is interpreted by a specialist guide. · Giants of the Savana- As the name suggests, this exhibit is the biggest animals on the African Savana. Visitors will see Elephants, lions, zebras, giraffes, cheetahs, warthogs and many other animals in these habitats. The Simmons Family Base Camp is also found here. Dallas Zoo has educational programs for schools, kids, and families to learn more about animals and conservation. Camps and Classes- Classes are offered for children as young as 10 months old with a parent at Dallas Zoo. Early Childhood education programs, scout programs, and group tours are offered. There are even special night programs available for groups including overnight tours, 3 hours night hikes, and aquarium visits. In addition to Wild adventure summer camps, family overnight campouts and night safari hikes are now being offered. Family Zoo Adventures- These monthly Saturday programs are themed and featured activity stations throughout the zoo, animal encounters and zoo guides that provide fun learning experiences for the whole family. Field Trips- Educators may schedule self-guided trips to the Dallas zoo in advance for discounted rates. Additional programming by age or grade level can be added on with details available online. The Dallas Zoo also offers teacher workshops, animal encounters, homeschool group activities, animals adventure outreach and guided tours of the zoo. Frog Club- This club is for children age 6 and up to learn about amphibians and work alongside Dallas Zoo Staff (with their parents) to record native frog species in the Dallas Fort Worth area. Participants will receive specialized training, a t-shirt, certificate, club card, and field guide. ExxonMobil Science Day- This Annual Event for educators, parents and students has ways for teachers to earn continuing Professional Education credit and brings the world of science to the forefront of visitor’s imaginations in innovative ways together with the zoo and aquarium. The Dallas Zoo works with select international conservation partners and captive breeding partners to manage field projects around the world, provide annual funding for research and captive animal management. 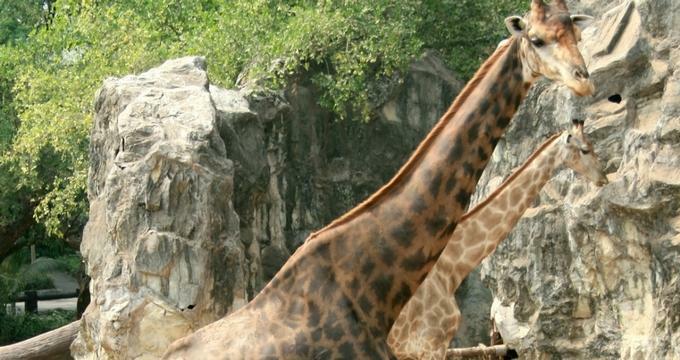 Some of the species survival plans that the Dallas Zoo is involved in include The Cheetah Conservation Fund, Horned Lizard Conservation, Diane Fossey Gorilla Fund International, GRACE, Okapi Conservation Project, Tarangire Elephant Project, Reticulated Giraffe Project and Dallas Zoo Green Team. The Dallas Zoo also accepts small electronics such as cell phones, iPod, tablets, and handheld devices for electronic recycling. They cannot accept computers or laptops. These devices will go to ECO-CELL and are accepted in all conditions to be refurbished. At any time during zoo hours there can be special events happening at the zoo from meetings to weddings, banquets or birthday parties. There are several spaces available to rent for private events at the Dallas Zoo including the Children’s Zoo, Giants of the Savana exhibit, the Amphitheater, Flamingo Room, and Prime Meridian Café. The Zoo will provide all catering services for special events that require food and beverage services. There is formal catering as well as picnic menu choices. Zoo to Do- This annual fall party at the zoo is a major fundraising event for the zoo complete with a huge silent auction, adult beverages, and more than 25 of the best chefs in Dallas providing food stations for distinguished guests. Live music and entertainment is provided late into the night. The Zoofari Market is in the North Zoo and is a giftshop with animal and conservation themed gifts, toys, apparel, and souvenirs. Purchases support the Dallas Zoo. Visitors to Dallas Zoo can bring in their own food and drinks with the exception of alcohol and glass containers, and straws. There are numerous picnicking areas designated throughout the zoo. There are also two grills, The Wilds of Africa Grill and Serengeti Grill, an ice cream and sweets shops, and the Prime Meridian Café in the Zoo North.